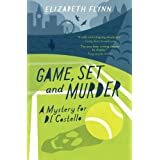 I bought this book for Mum, who is a fan of tennis and an avid reader of crime fiction. Unfortunately she was disappointed in it. So I read it to find out why. I am not interested in tennis (Mum put me off!) and have given up reading crime fiction as I did not find it at all edifying. This book is not in the usual style of the genre. It is more like a game of Cluedo! In fact it would be suitable for young adults. D. I. Costello was well educated at her convent school. She never seems to put a foot wrong. The suspects’ characters are well-drawn and the mystery is solved satisfactorily.